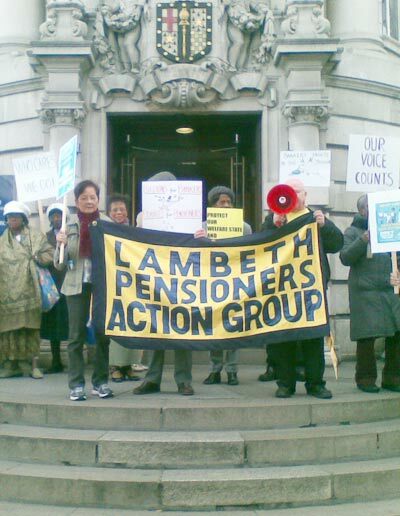 Welcome to the Lambeth Pensioners Action Group web site. LAMPAG was founded in 1979 and since that time has campaigned for better pensions and services for older people in Lambeth. We are a non-party, non-sectarian and multi-ethnic group who uphold the principle of dignity advocacy and respect in old age. We are entirely self-funded through membership subscriptions, donations and the occasional award or grant. We are affiliated to the National Pensioners’ Convention and alongside pensioners throughout the country we fight for the principles set out in the Pensioners’ Charter including the right to a pension above the poverty level for men and women and for free health care services. Our recently published Pensioner's Manifesto also outlines the guiding principles that we as an organsation seek to maintain.